Recorded between 2000 and 2004, Biome features eight tracks of pure electro-static sound. What sets Biome apart from similar attempts to recapture the early cosmic courier sound is the profession and execution of a singular aesthetic: no samples, no overdubs, no post-production editing - simply a heavily processed guitar and a modular synth to capture the raw immediacy of interstellar transmissions apparently received and decoded from Arecibo. There's no doubt about the debt Magnetize owes to the Cologne/Dusseldorf axis of industrial-strength electronic music. The spirit of Neu, Kluster and early Kraftwerk looms thick around the assemblage of sound presented on Biome and at times threatens to envelop it completely. Fortunately, Magnetize's refusal to utilize the potential of the studio itself as an instrument keeps Biome fresh and uncluttered. Pieces like "Free Running" and "Re-Sensifier" crackle with the high energy of cosmic radiation filtered through a particle accelerator hotwired to an amplifier. And while the sequential rhythms occasionally tether Magnetize's astral drone to Earth base, it's abundantly clear that the rendezvous with the mother planet is only a temporary visit to refuel the stardrive for yet another excursion through the dark light years. 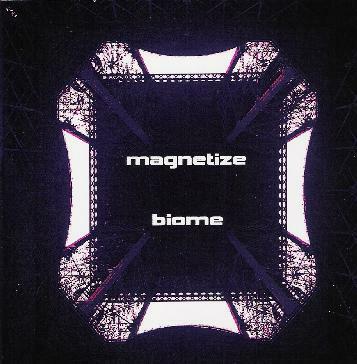 Surprisingly, the pieces on Biome are never overly repetitive or unduly clinical, which is why Magnetize often reminds one of a less teutonic Klaus Schulze (particularly during the heady space cadet daze of Irrlicht and Cyborg) or an updated version of Zanov (circa Green Ray). Perhaps as a consequence, Biome turns out to be a superb - if not wholly original - debut disc of electronic sound captured and reconstituted from the frontiers of chaos. For more information you can visit the Magnetize web site at: http://www.magnetize.biz. Visit the Rimbaud Records web site at: http://www.rimbaudrecords.com.